Festivals are a respectable and integral part of a British summer these days, but it aint always been that way. This is the story of those that died in the festival wars so people could wander around farms in designer wellies and big foam hats without getting arrested. 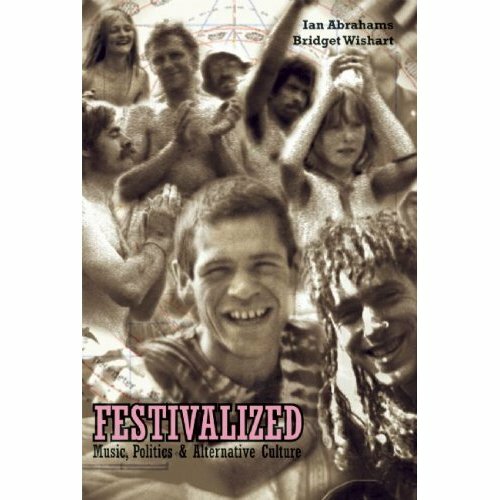 Not quite the definitive history of the UK free festival scene of the 70s/80s/90s, more a snap shot – an oral history with a collection of anecdotes from people who were there at the time. Bridget Wishart, member of the Hippy Slags and the only woman ever to front Hawkwind, is as well connected as anyone to collate these stories. The list of contributors reads like a who is who of UK counterculture. Nick Turner (Hawkwind), Swordfish (Magic Mushroom Band), Penny Rimbaud (Crass), Mick Farren (Pink Fairies and journalist) are just the tip of the iceberg of the contributors. Even our own Clint Iguana gets to have a say. Bridget Wishart herself is particularly open and talks of personal issues she had to deal with as a result of being involved with the scene. It is always difficult to tell a complete story by using anecdotes of this nature. Coming at it from a position of someone who has read widely on the subject it is difficult to tell if someone with less knowledge would be able to follow the thread. But from our point of view it is a valuable addition to the limited library on the subject. Inevitably there are conflicting opinions on what festivals were actually for. Were they a political statement of opting out of capitalism, were they spiritual gatherings, were they opportunities for drug dealers to sell their wares, were they places to catch decent live music or were they just one big hedonistic blow out? Opinions differ throughout the book. Split into chapters, roughly in chronological order, it looks at some of the pivotal festivals and some of the hot topics – politics, hedonism, bands, drugs and so on. One thing that stands out throughout is the DIY ethic and everyone chipping in to make things happen, whether it be building stages, catering or (in rather basic form) sanitation. Whilst it often looked like nothing had been organised and it was all ad-hoc, often the bands had been lined up weeks in advance. Nothing in life is simple and a few of the contributors touch on the law of unintended consequences, such as the police mobbing up to tackle pickets during the miners’ strike giving them the confidence to physically attack free festivals – and that in turn radicalising otherwise hedonistic festival goers. There is an interesting look at the development of the Peace Convoy and how it became corrupted as more and more urban dropouts joined in and drugs became more prevalent. The growing popularity of free festivals was part of their downfall. Stonehenge attracted somewhere between 70,000 and 100,000 in 1984. This would be a challenge for the best of professional organisers in terms of infrastructure, let alone a band of itinerant hippies. The presence of 500 Hells Angels did not help things. As the book draws to a close it looks at Castelmorton. This was an event that will go down in folk lore and in many ways it was the straw that broke the camel’s back. Whilst the police had clamped down at the Battle of the Beanfield in 1985, they were just flexing their muscles and demonstrating that they were in charge, even though the law did not necessarily back that up. Castelmorton was such a huge event, acted out in front of TV cameras, it was felt that if the police did not have the legal powers to deal with this, the law needed to change. So in comes the Criminal Justice Act with its criminalising of gatherings of more than a handful of people and the bizarre criminalising of music played in the open air that was ‘wholly or predominantly characterised by the emission of a succession of repetitive beats’. Castlemorton changed the game, and to a certain extent was a victim of its own success. In previous years the Avon Free Festival had not been particularly big. The year before we at Peppermint Iguana had spent a whole day driving around the West Country trying to find it before giving up. But in 1992 the Avon and Somerset Constabulary very kindly escorted everyone who wanted to attend over their border and dumped them outside Malvern for the neighbouring force to deal with. The uproar of these ‘new age brigands’ landing in sleepy Castlemorton was big news on the TV – but the problem was that all of a sudden everyone knew where the party was and the festival just grew and grew. That was, to all intents and purposes, the end of the free festival scene. For some enough was enough and they headed over to the continent to party. For those that wanted to keep the spirit going, it was the start of a long journey of change the way things were done, dealing with authorities and looking for a new model for festivals. From the outside, festivals can look like just a bunch of hedonists getting out of it in a field for the weekend. Ironically many of the officially sanctioned commercial ventures can be just that, but the more chaotic free festivals were spaces where ideas were shared, attitudes were changed and personal philosophies were shaped. People thought about the world around them, saw that there were alternatives and many people’s outlooks on life today still reflect those experiences in a field several decades ago. The ripples from that scene are still travelling outwards, whether it be people organising licensed grass roots events, getting involved in the anti-war movement or simply living off grid. Free festivals are few and far between these days but the ghost of the scene can be found at events like Surplus, Equinox and Something Else parties. As the saying goes, you can’t kill the spirit.